What cows eat and how much they need varies by age and type. Feeding specifics also depend on what’s available in your area. Pregnant cows require even more nutrients than others do, but their needs can be met by choosing foods that provide plenty of energy and protein. As long as you give her enough to eat containing the nutrients she requires you can expect that your cow and her calf will do well. Hay, a staple of the cattle diet, is often fed to pregnant cows even if they have access to pasture. The average cow will eat between 20 and 30 pounds per day of good-quality hay such as alfalfa. You can supplement with haylage -- hay that has been chopped and bagged or otherwise stored until it begins to ferment, increasing its nutritional value. If the cow doesn’t have access to pasture, give her access to hay at all times, especially in late pregnancy. A pregnant cow needs plenty of grain to meet her energy needs and the needs of her growing calf. Grain comes in various forms, generally cracked, ground, pelleted or made into meal. A heifer who is still growing herself will need more than an older birthing cow; any cow in the last two months of her pregnancy needs more than she did during the first part of gestation. Common grains fed to a pregnant cow include corn, barley, wheat, rye and oats. Supplements help to make sure a pregnant cow gets all the nutrients she needs to have a healthy calf. 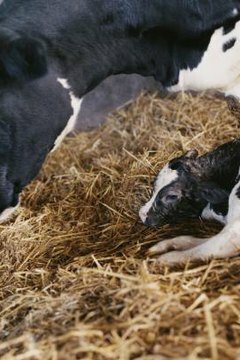 This is essential if her regular feed is lacking anything; it can be highly beneficial in later pregnancy, as the size of the calf reduces how much the cow is able to eat. Molasses is a common additive, providing lots of energy as well as iron and vitamins. Other extras include soybean meal, fish meal, blood meal and commercial protein supplements. Silage is similar to haylage but is commonly made of corn. Depending on the location and conditions, silage may consist of sorghum, perennial peanuts, various small grains, clover and other grasses. Silage may contain soybeans, chopped sugarcane or millet. Several ingredients are often mixed together to create a palatable food high in nutritional value. It’s generally not practical to make silage to feed just one or two cows, but it serves producers with large herds. The Haylage Company: What Is Haylage?